Plantar fasciitis may be referred to as plantar fasciosis, plantar heel pain, plantar fascial fibramatosis, among others. Because many cases diagnosed as “plantar fasciitis” are not inflammatory conditions, this condition may be best referred to as "plantar fasciosis." This is confirmed through histological analysis which demonstrates plantar fascia fibrosis, collagen cell death, vascular hyperplasia, random and disorganized collagen, and avascular zones. There are many different sources of pain in the plantar heel besides the plantar fascia, and therefore the term "Plantar Heel Pain" serves best to include a broader perspective when discussing this and related pathology. The plantar fascia is comprised of white longitudinally organized fibrous connective tissue which originates on the periosteum of the medial calcaneal tubercle, where it is thinner but it extends into a thicker central portion. The thicker central portion of the plantar fascia then extends into five bands surrounding the flexor tendons as it passes all 5 metatarsal heads. Pain in the plantar fascia can be insertional and/or non-insertional and may involve the larger central band, but may also include the medial and lateral band of the plantar fasica. The plantar fascia is best referred to as fascia because of it's relatively variable fiber orientation as opposed to the more linear fiber orientation of aponeurosis. 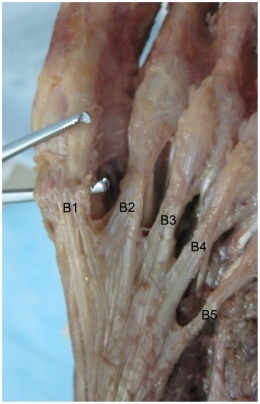 The plantar fascia blends with the paratenon of the Achilles tendon, the intrinsic foot musculature and even the skin and subcutaneous tissue. The thick viscoelastic multilobular fat pad is responsible for absorbing up to 110% of body weight during walking and 250% during running and deforms most during barefoot walking vs. shod walking. During weight-bearing, the tibia loads the the foot “truss” and creates tension through the plantar fascia (windlass mechanism). The tension created in the plantar fascia adds critical stability to a loaded foot with minimal muscle activity. Evidence of the important stabilizing nature of the plantar fascia is evidence when following cases post surgical releas which may lead to midfoot arthritis, rupture of the secondary stabilizers of the arch (e.g spring ligament) , as well as other pathologies. The average plantar heel pain episode lasts longer than 6 months and it affects up to 10-15% of the population. However, approximately 90% of cases are treated successfully with conservative care. Although this condition is seen in all ages, it is most commonly expereinced during middle age. Females present with plantar heel slightly more commonly than males and occurs more frequently in an athletic population such as running, accounting for up to 8-10% of all running related injuries. In the US alone, there are estimates that this disorder generates up to 2 million patient visits per year, and account for 1% of all visits to orthopedic clinics. Plantar heel pain is the most common foot condition treated in physical therapy clinics and accounts for up to 40% of all patients being seen in podiatric clinics. Plantar fasciitis is a clinical diagnosis. It is based on patient history and physical exam. Patients can have local point tenderness along the medial tuberosity of the os calcis, pain on the first steps or after training. Plantar facia pain is especially evident upon dorsiflexion of the patients pedal phalanges, which further stretches the plantar fascia. Therefore, any activity that would increase stretch of the plantar fascia, such as walking barefoot without any arch support, climbing stairs, or toe walking can worsen the pain. The clinical examination will take under consideration a patient's medical history, physical activity, foot pain symptoms and more. The doctor may decide to use Imaging studies like radiographs, diagnostic ultrasound and MRI. The Foot and Ankle Ability Measure, is a good outcome measure to give to patients that are diagnosed with plantar fascitis. A few studies have also used the Foot Function Index but only the the pain subscale. It is a validated measure, and the first 7 items of the pain subscale are used as the primary numeric outcome measure. Items are scored from 0 (no pain) to 10 (worst pain imaginable) depending on the mark on the visual analog scale. The sum of the 7 items is then expressed as a percentage of maximum possible score, ranging in an overall percentage. Ultrasound can help diagnose and confirm plantar fasciitis/fasciosis through the measurement of the plantar fascia thickness. Because of the advantages of ultrasound-that it is non-invasive with greater patient acceptance, cost effective and radiation-free-the imaging tool should be considered and implemented early in the diagnosis and treatment of plantar fasciitis/fasciosis. Imaging the ankle/hind foot in the upright weight-bearing position with a dedicated MRI scanner and a dedicated coil might enable the identification of partial tears of the plantar fascia, which could be overlooked in the supine position. When conservative measures fail, surgical plantar fasciotomy with or without heel spur removal may be employed. There is a method, through an open procedure, percutaneously or most common endoscopically, that releases the plantar fascia. This is an effective treatment, without the need for removal of a calcaneal spur, when present. There is a professional consensus, 70-90% of heel pain patients can be managed by non-operative measures. Surgery for plantar fasciitis should be considered only after all other forms of treatment have failed. With an endoscopic plantar fasciotomy, using the visual analog scale, the average post-operative pain was improved from 9.1 to 1.6. For the second group (ESWT), using the visual analog scale the average post-operative pain was improved from 9 to 2.1. Endoscopic plantar fasciotomy gives better results than extra-corporeal shock wave therapy, but with liability of minor complications. The most common treatments include stretching of the gastroc/soleus/plantar fascia, orthotics, ultrasound, iontophoresis, night splints and joint mobilization/manipulation.
. Level of evidence 5. Stretching consists of the patient crossing the affected leg over the contralateral leg and using the fingers across to the base of the toes to apply pressure into toe extension until a stretch can be felt along the plantar fascia. Achilles tendon stretching can be performed in a standing position with the affected leg placed behind the contralateral leg with the toes pointed forward. The front knee was then bent, keeping the back knee straight and heel on the ground. The back knee could then be in a flexed position for more of a soleus stretch. Level of evidence 1b. Mobilizations and manipulations have also been shown to decrease pain and relieve symptoms in some cases. Posterior talocrural joint mobs and subtalar joint distraction manipulation have been performed with the hypomobile talocrural joint. Patients in 6 different cases demonstrated complete pain relief and full return to activities with an average of 2-6 treatments per case. Level of evidence 4. A recent study evaluated the effect of ankle, subtalar and midfoot joint mobilizations on pain and function in patients with PF. The researchers hypothesized that mobilization of this joints, in addition to conventional physical therapy, would significantly improve pain and function on patients with PF, as opposed to conventional treatment only. The mobilization in conjunction with conventional therapy did not improve pain and function more than conventional treatment alone in patients with PF. Ankle and midfoot joint mobilization aimed at improving DF rang om motion is not more effective than ultrasound and stretching alone in treatment of PF. The association between limited DF and PF most probably is based on calf muscle shortening and not on ankle or foot joint mobilization. Therefore, treatment should be focused on soft tissue techniques rather dan on foot and ankle joint mobilization. Level of evidence 1b. Posterior-night splints maintain ankle dorsiflexion and toe extension, allowing for a constant stretch on the plantar fascia. Some evidence reports night splints to be beneficial but in a review by Cole et al he reported that there was limited evidence to support the use of night splints to treat patients with pain lasting longer than six months, and patients treated with custom made night splints improved more than prefabricated night splints. Level of evidence 1a. Six treatments of acetic acid iontophoresis combined with taping gave greater relief from stiffness symptoms than, and equivalent relief from pain symptoms to, treatment with dexamethasone/taping. For the best clinical results at four weeks, taping combined with acetic acid is the preferred treatment option compared with taping combined with dexamethasone or saline iontophoresis. Level of evidence 1b. Foot orthoses produce small short-term benefits in function and may also produce small reductions in pain for people with plantar fasciitis, but they do not have long-term beneficial effects compared with a sham device whether they are custom made or prefabricated. Level of evidence 1b . When used in conjunction with a stretching program, a prefabricated shoe insert is more likely to produce improvement in symptoms as part of the initial treatment of proximal plantar fasciitis than a custom polypropylene orthotic device . Level of evidence 2b. Recent searches were done toward the effects of short-term treatment with taping for plantar fasciitis. For an entire week the tape was placed on the gastrocnemius and the plantar fascia. It was concluded that the additional treatment with continuous taping for one week might alleviate the pain of plantar fasciitis better than a traditional physical therapy program only, but it’s a short-time effect Level of evidence 2b,level of evidence 2a, level of evidence 1a. ↑ Lemont H, Ammirati KM, Usen N. Plantar fasciitis: a degenerative process (fasciosis) without inflammation. J Am Podiatr Med Assoc. 2003;93(3):234–7. ↑ Carlson RE, Fleming LL, Hutton WC. The biomechanical relationship between the tendoachilles, plantar fascia and metatarsophalangeal joint dorsiflexion angle. Foot ankle Int / Am Orthop Foot Ankle Soc [and] Swiss Foot Ankle Soc. 2000;21(1):18–25. ↑ Stecco C, Corradin M, Macchi V, et al. 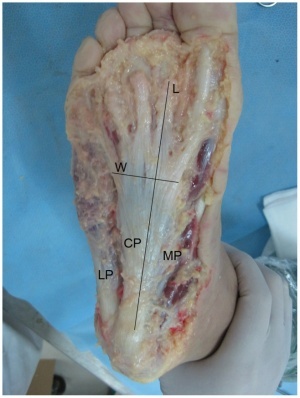 Plantar fascia anatomy and its relationship with Achilles tendon and paratenon. J Anat. 2013;223(August):1–12. doi:10.1111/joa.12111. ↑ Tweed JL, Barnes MR, Allen MJ, Campbell J a. Biomechanical consequences of total plantar fasciotomy: a review of the literature. J Am Podiatr Med Assoc. 2009;99(5):422–30. ↑ Cheung JT-M, An K-N, Zhang M. Consequences of partial and total plantar fascia release: a finite element study. Foot ankle Int / Am Orthop Foot Ankle Soc [and] Swiss Foot Ankle Soc. 2006;27(2):125–32. Available at: http://www.ncbi.nlm.nih.gov/pubmed/16487466. ↑ McPoil TG, Martin RL, Cornwall MW, Wukich DK, Irrgang JJ, Godges JJ. Heel pain--plantar fasciitis: clinical practice guildelines linked to the international classification of function, disability, and health from the orthopaedic section of the American Physical Therapy Association. J Orthop Sports Phys Ther. 2008;38(4):A1–A18. doi:10.2519/jospt.2008.0302. ↑ Lopes AD, Hespanhol Júnior LC, Yeung SS, Costa LOP. What are the main running-related musculoskeletal injuries? A Systematic Review. Sports Med. 2012;42(10):891–905. doi:10.2165/11631170-000000000-00000. ↑ 2002 Podiatric Practice Survey. Statistical results. J Am Podiatr Med Assoc. 2003;93(1):67–86. Available at: http://www.ncbi.nlm.nih.gov/pubmed/12533562.